We are proud to believe that our school is the most sought after school at Navi Mumbai. Our management takes every effort to make the education of special children entertaining and fun. 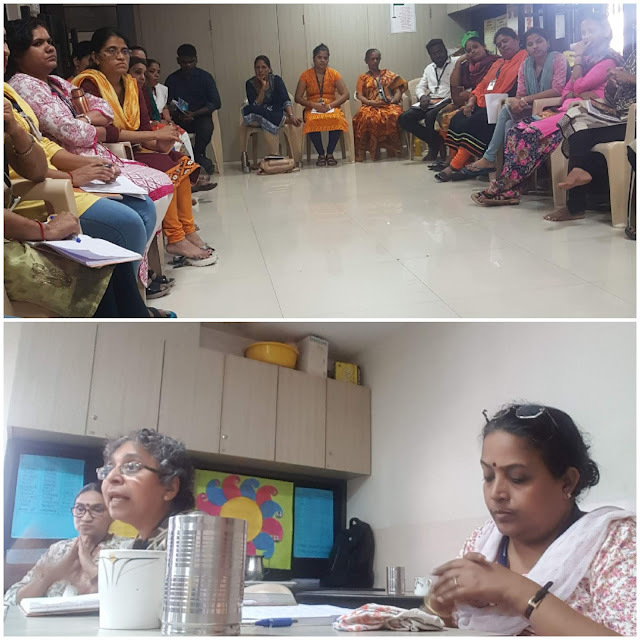 The meetings with the staff are held regularly whereby teachers are guiding in correct teaching methods to be carried out at school. Every festival and every event is celebrated at school as a hands-on learning experience. On the days when children have public holidays, teachers are expected to report to school. During those days, some workshops or lectures by experience personals are organised at school to enrich the teaching methods of the staff. 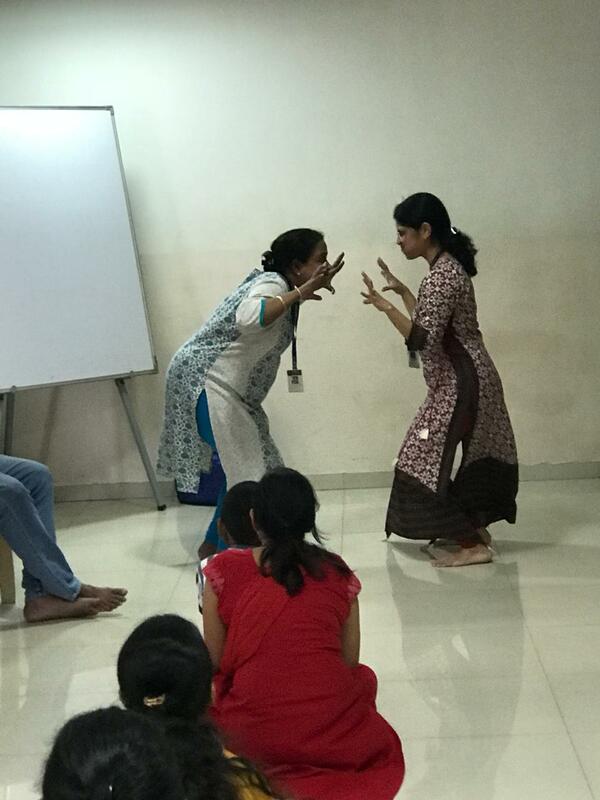 This week too, while children were enjoying their Ganesha festivals, teachers attended a “Theatre Workshop” organised at school by dramatist Mr. Shivdas Ghodke on 14th September from 1pm to 4pm. 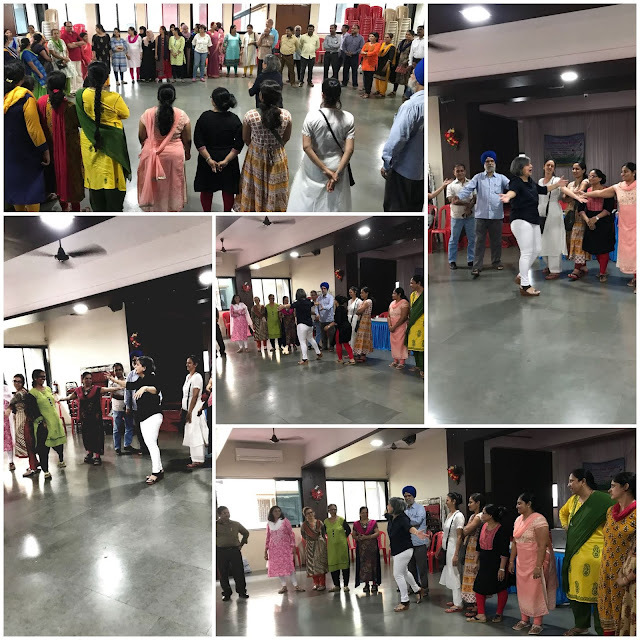 Sixteen teachers took part in this workshop and each one was having a very good time. There was no inhibition in performing any activity at all. They walked with bent knees, they crawled on the floor, they even mimed. Teaching special children can be fun, they need not struggle to write alphabets, memorise long paragraphs or solve difficult problems, learning can be done informally through play and drama and that was all this workshop was about. Different aids were used for team activities that need large spaces. Bamboo rods were used to form designs on the floor and to imagine what activity can be performed using the stick. (for example..rods can be used for drying clothes, shooting like rifle or using as stump for playing snookers). 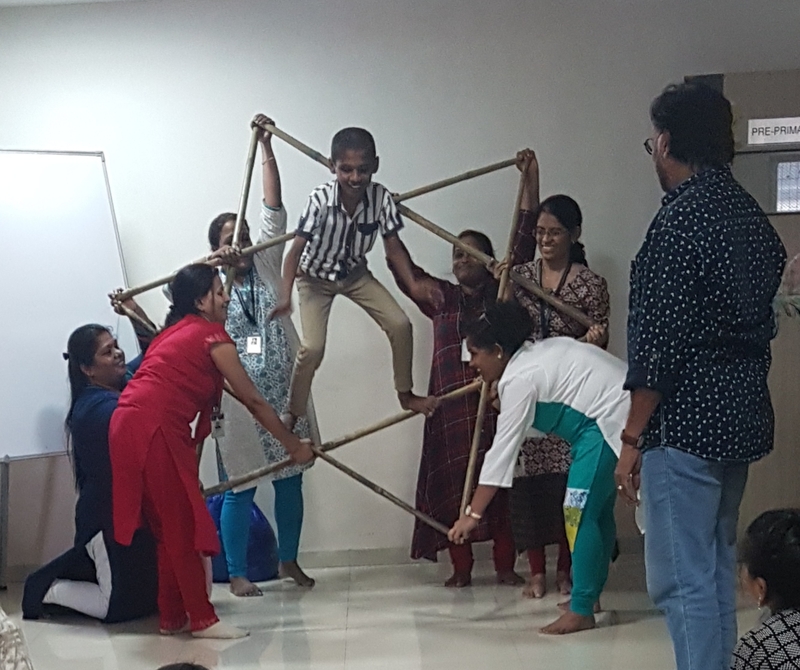 Teachers used bamboo sticks to design a star shape. Collectively they lifted it horizontally and child was made to hop on the shape. Such big bamboo stick needs larger space to perform such activities, although it can be incorporated in dance and drama with background music. But a smaller stick can in used in the classrooms too and some teachers are using it in their lesson plans. “I give my students ice cream sticks for making shapes and alphabets and let them imagine things like ice cream and other things, but I normally use it on individual level. But today’s stick therapy is good for group activity. We will reduce the size of the stick to make the activity easier in the class level” said Vidya, teacher of Primary 1. Luckily there were two children who were also the part of the group. 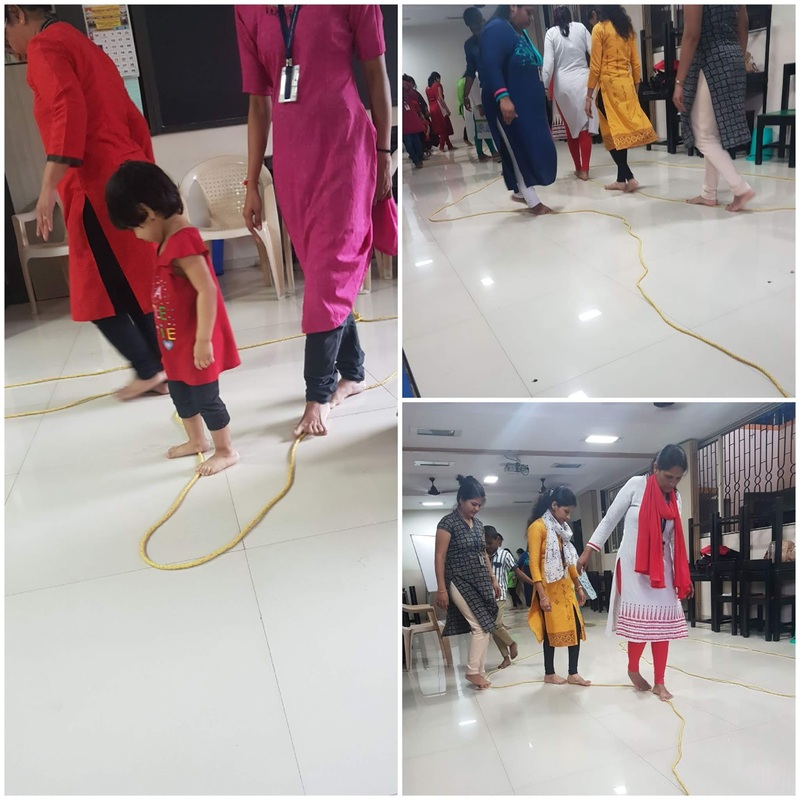 They too participated in many activities and helped us understand how far can we stretch an activity with special children. Some activities were shown with a rope, 15 meters long and 3 inches thick. It helped us understand the limited force that would be required to form designs with the rope by swinging one end of the rope in different directions. 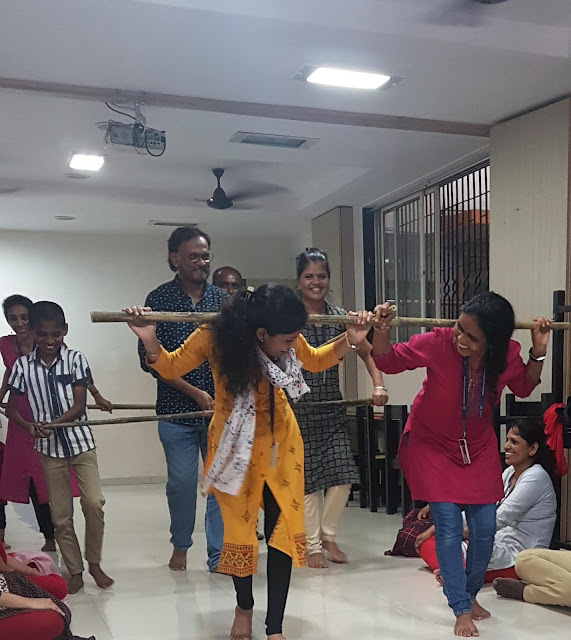 Charushila found the use of rope in her therapy class as very useful aid. “This exercise is good to channelize energy and also for dissociation of joints.” She said. 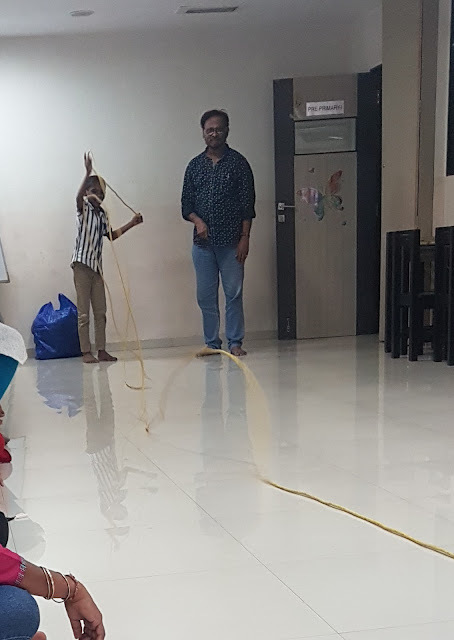 Spreading the rope on the floor and making the teachers walk on the rope was a clever idea. “I liked walking activity. This is helpful for balancing, coordination and muscle strength” said Smita. Using long ropes in smaller classrooms is impractical but using duppattas, colorful tape or sari fall (as suggested by Grace and Smita Vartak ) would be more logical. The session went on till 4:30 but nobody complained of the extended hour. In fact some teachers wanted one more session. “I would personally request Shirish Tr and Sukanya Tr. to arrange more sessions by Sir in which he will give us input on voice modulations, making masks etc. 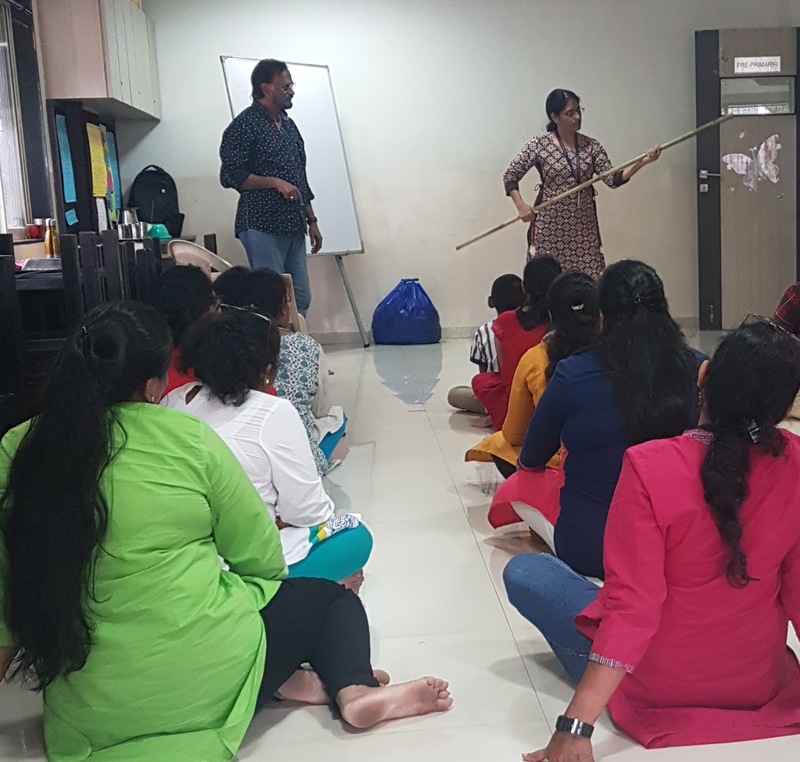 Sir is very experience person who has worked with special children from many years .So his sessions will definitely be helpful for us....” said Vidya teacher of Primary 1 class. more pictures of this workshop can be found on our school blog. Life can be very lonely if you have differently abled child. Many parents don't have time to seek their own space. The simple pleasures of watching a film in the cinema hall or visiting a salon for a new haircut or simply strolling through the mall for window shopping is the luxury they cannot afford. Differently abled children need lot of attention, some parents are over protective of their children, they will not let them undertake any chores at home for the fear of some accidents. 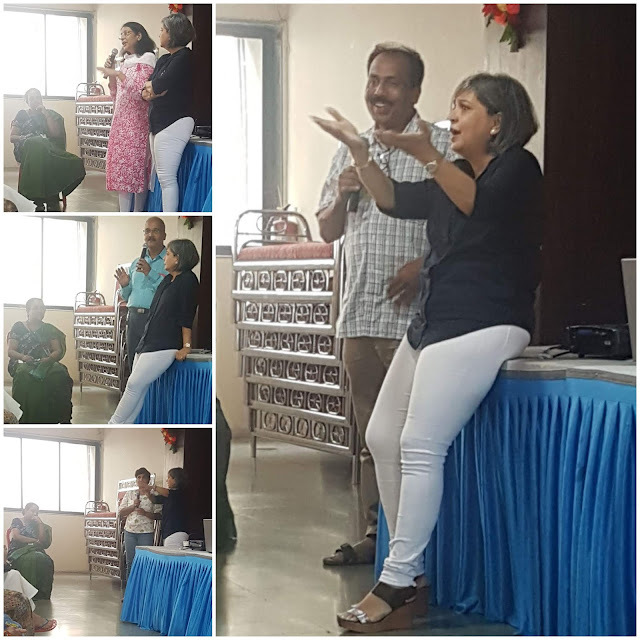 Such stories and many more were discussed at the workshop on ‘Empowering Parents’ by Gulshan Kavarana on 7th August 2018. The program started with the brief introduction by one of the parents. 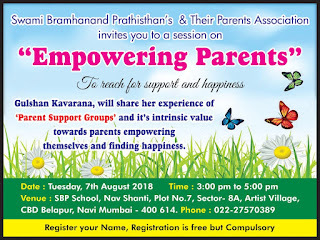 "Gulshan Kavarana is the founding member of SFS (Special Families Support group) a support group for families with children with special needs and the Art Mentor at Mawaheb, an art studio for adults with special needs. It is safe to say that Gulshan’s life changed drastically when her second daughter Zara was born in 1997. Zara has been diagnosed with Dravets Syndrome, a rare form of epilepsy she also in the Autism spectrum which was triggered by a vaccine. 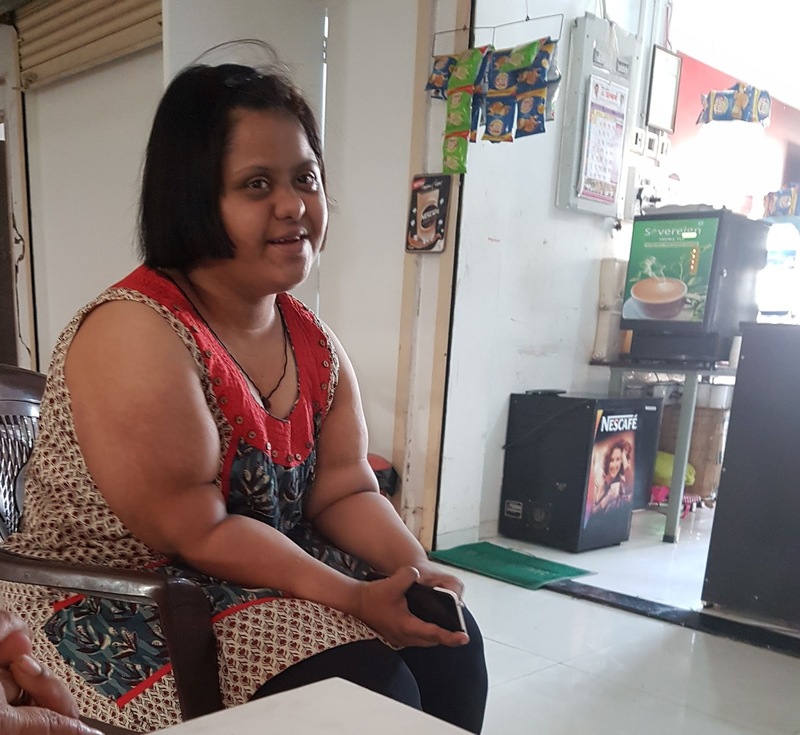 When Gulshan found out about her condition she went desperately seeking help and advise from other parents in similar situations, as she was a new resident of Dubai. She felt as though she was drowning in self pity and felt she was the only one going through the stages of acceptance: guilt, denial, self pity, anger, hopelessness and finally, the best stage of all acceptance… Thus SFS was born. SFS or Special Families Support Group, started in 1999 with a dozen families in Gulshan’s living room. The motivation behind the group’s initiation was to bring together and uplift children with special needs and most importantly their families." Gulshan expressed the fact that nobody is prepared for a special child and when she was faced with the problems of dealing with the daughter who had Dravets Syndrome, she was confused and looked desperately for support. Not finding much information on the net, she invited six families with similar problems and formed a support group. it is then she realised that the support group is like a special close knit family who are more helpful than the doctors, teachers or any other professionals. They are the ones who narrow the gap of loneliness and are supportive in giving advice and solutions from their own experiences. In a support group, parents with older children can give better advise. Gulshan raised the question about how they felt when they took their child for an outing? The stories that poured out about the challenges that the parents faced were heart breaking. Parents complained that their children did not get respect in the community and they were always cast aside, about how people stood and stared at their differently abled persons, about their trips at restaurants where people complained about the noise that their children made and how they are forced to leave the restaurant, as the result they hardly ever went out. During the interaction, many parents then came up with solutions on how to deal with such situations. One parent suggested that there are two choices to every situation, you can either cry or laugh. She said that her happiness comes first and therefore what she will experience will depend on choices that she makes. She had to make decision and do what she feels is right. Gulshan stressed on the idea that everybody has right to enjoy their life and that one should not feel guilty of leaving their child at home or with a friend to enjoy some moments with their spouse or with friends. She encouraged parents to meet regularly and socialise freely- organising pot luck lunches, movies or outings. She believes that support group is one large family who will understand your problems and will be willingly to help you without judging you. She advised parents to make their children independent so that it will get easier in their later life. They must be given time, space and exposure, to let them grow independently on their own strength and capability. There is need to plan for their future and arrange a residential home (If required) so that sibling do not have to take responsibility of taking care of them all life. By the end of the workshop the parents were in good spirit and promised to keep in touch with each other. 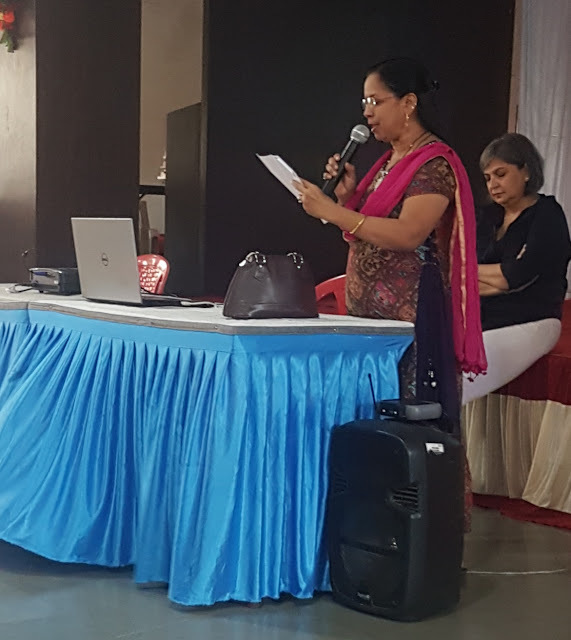 The workshop by Gulshan Kavarana was very enlightening and she encouraged parents to form a self support group where they could socialise and help each other. Parents returned home with a beautiful smile and must have remained cheerful for the rest of the day. Every parent’s main worry is what will happen to their child after they are there no more. The siblings have a life of their own and it becomes difficult for them to take care of their intellectually challenged persons. There is dire need for residential homes. 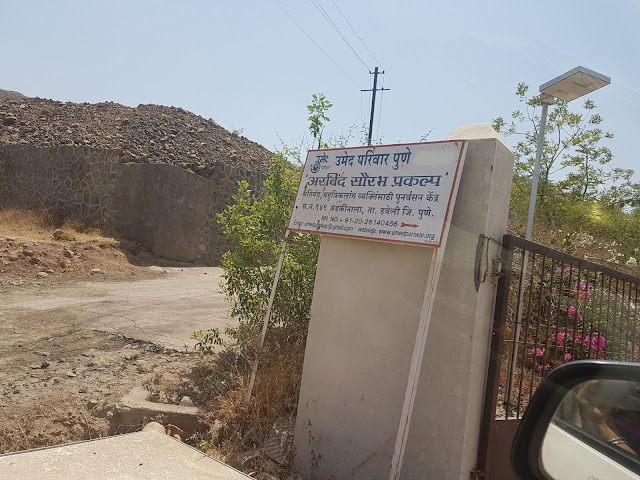 I had privilege to visit one such home at Pune called Arvind Saurabh, also known as Umed Pariwar. 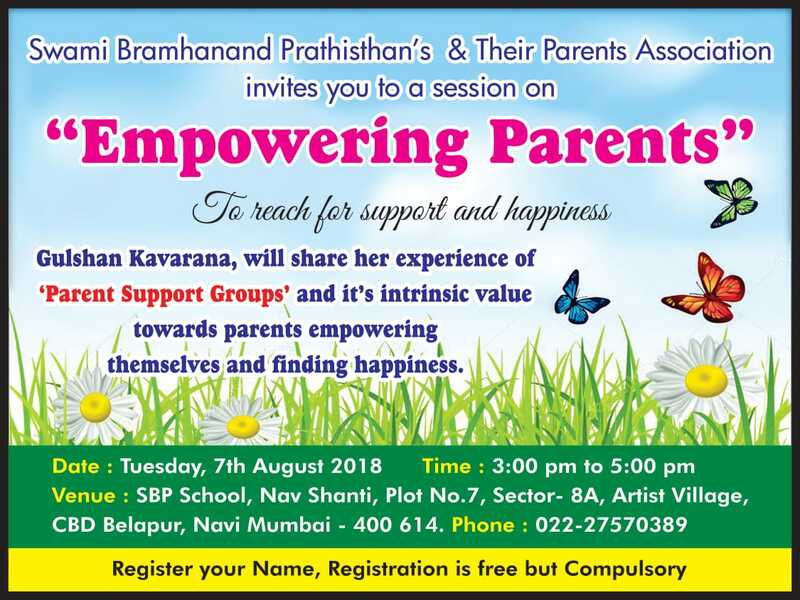 Founded in 1990, Arvind Saurabh is Pune based Parent’s organisation that works for the specialised needs and betterment of Mentally Challenged and Cerebral Palsy persons. 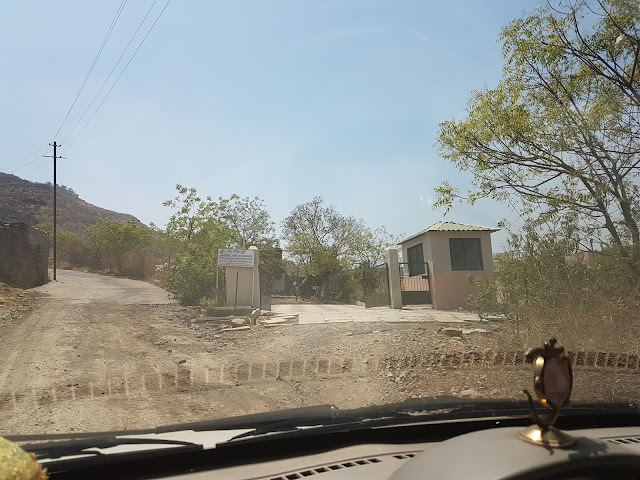 This home is located at Wadaki Nala, on Hadapsar Saswad Road on the foothills of Kanifnath temple. 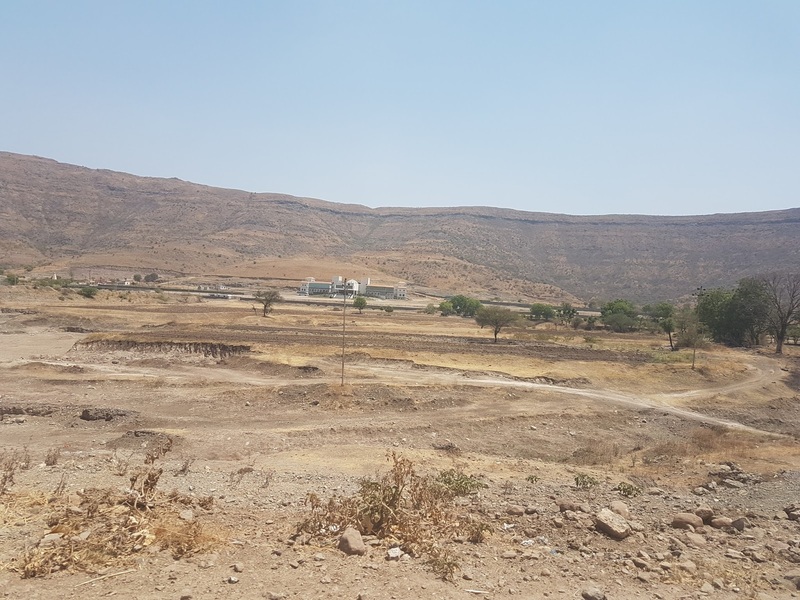 It is located at 25kms from Pune. We drove through barren land, through the mud path to arrive at beautiful 10-acres wide campus in the midst of large open landscape. We were greeted by Jyoti Nahar, one of the parents, who is the resident at the campus. 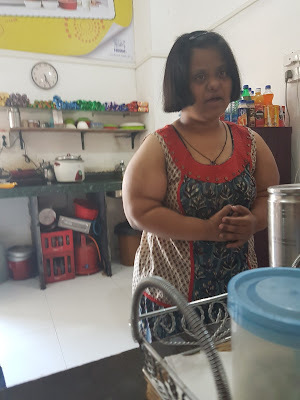 She took us around showing us the facilities at the home. At the vocational room, lots of activities are carried out such as paper bag making, making office files, envelops, handmade paper articles, gift articles and many such activities. 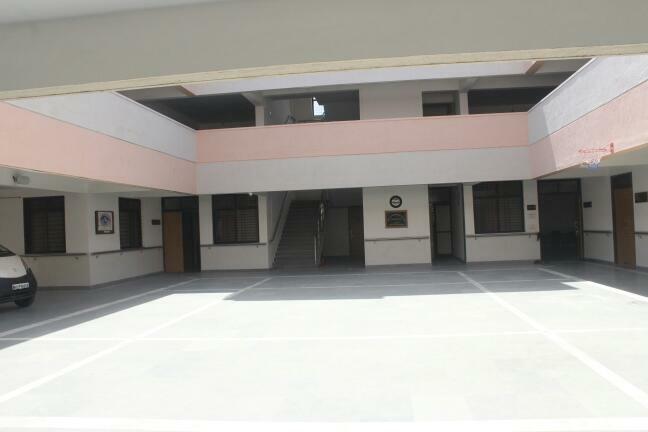 The building is very neat with a large courtyard in the centre where children can play outdoor activities, surrounded on all sides with large bright rooms. The dormitory had 6-8 beds in a room, fairly distant with beds and cupboards. The bathrooms are large enough to accommodate a wheelchair and designed to cater to their special needs. There are smaller private rooms upstairs for children who are independent or wish to stay with their live-in parents. We were then invited for lunch. The campus has in-house vegetable gardening and diary facility. 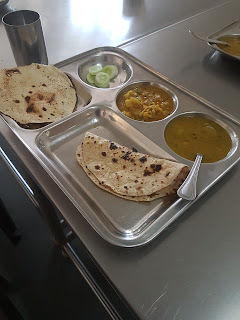 The food was nutritious and very tasty. I was quite impressed with the facilities at this place. 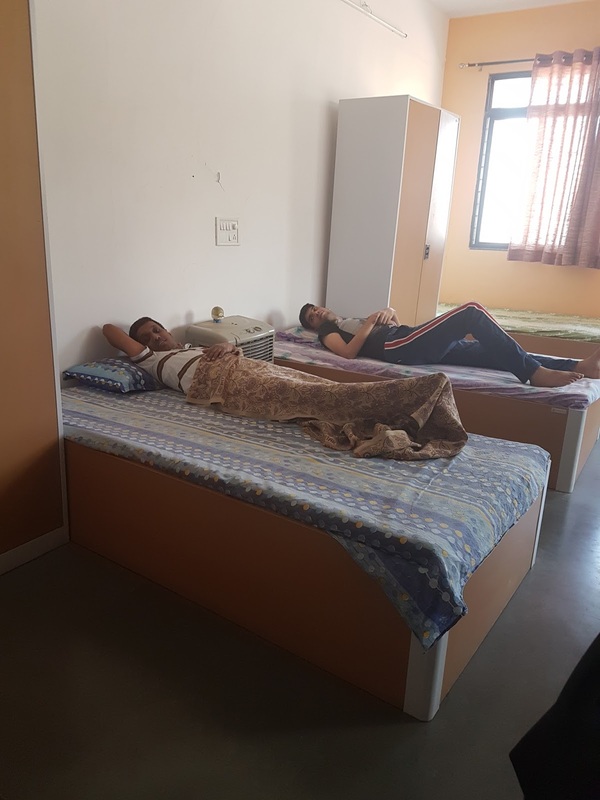 There was solar and windmill energy, a swimming pool with hydrotherapy, modern kitchen facility with dinning hall, polyclinic facility for health check up, gymnasium facilities and guest house for parents, so that they can come and stay with their children. The intellectually challenged adults looked quite content and cheerful and were quite happy to meet us and click pictures with us. The greatest happiness that any teacher feels is when her students achieves success in life. When the student is special with downs syndrome, the happiness is ten fold. Normally the first reaction that the parents get when they get a special child with down syndrome is one of shock and confusion. They feel their world has fallen apart, they are frightened for the future. But after few years, they begin to understand their child and learn that children with down syndrome are really very talented. If trained under special care, they are as capable of leading a normal life as any other normal person, only a little bit slower and may need supervision. Aditi Verma beat disability and became entrepreneur when her parents gifted her with eatery on new year’s day last year. 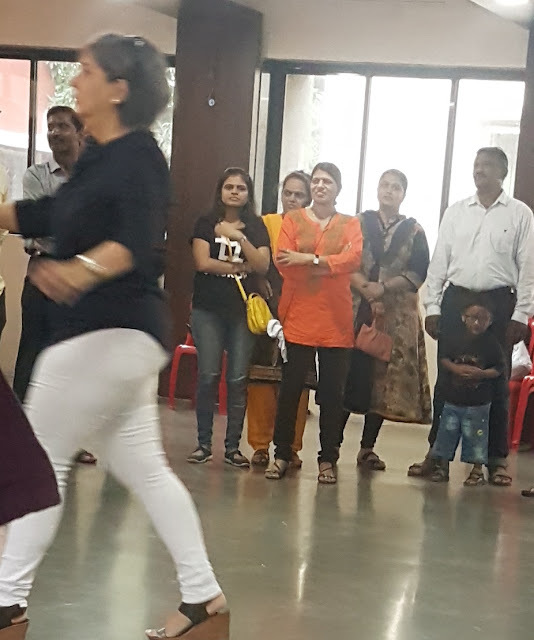 On my recent visit to school at CBD, Belapur, I decided to spend one afternoon at Bhoomi Mall at CBD after school hours. Bhoomi mall is still new, with many shops waiting to find its owner, but three floors upstairs is a small eatery called ‘Aditi’s Corner’ that sells chocolates, drinks and snacks and is run by Aditi Verma who has Down Syndrome. “Everyday is different lunch” she explains. 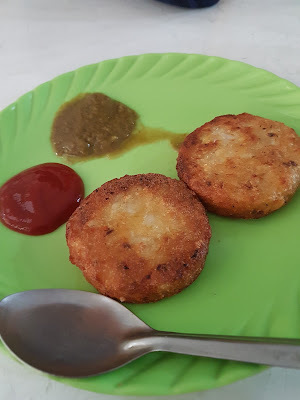 The food is cooked at home and the servings are just heated in microwave at the stall. There are many offices in this mall that patronise her café. I glance into her eatery and see chocolates, wafers, biscuits, Maggi packets, soft drinks along with sandwiches. 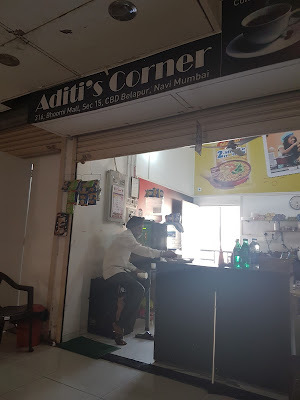 There is a small fridge in one corner, a coffee and tea making machine on the other side. I am not really hungry and cannot decide what to order. “Will you have corn pattice?” she offers. I order for one dish that I share with my friend. The frozen corn pattice are removed from fridge and heated on hot grill and served with tomato sauce and mint chutney. It tastes good. 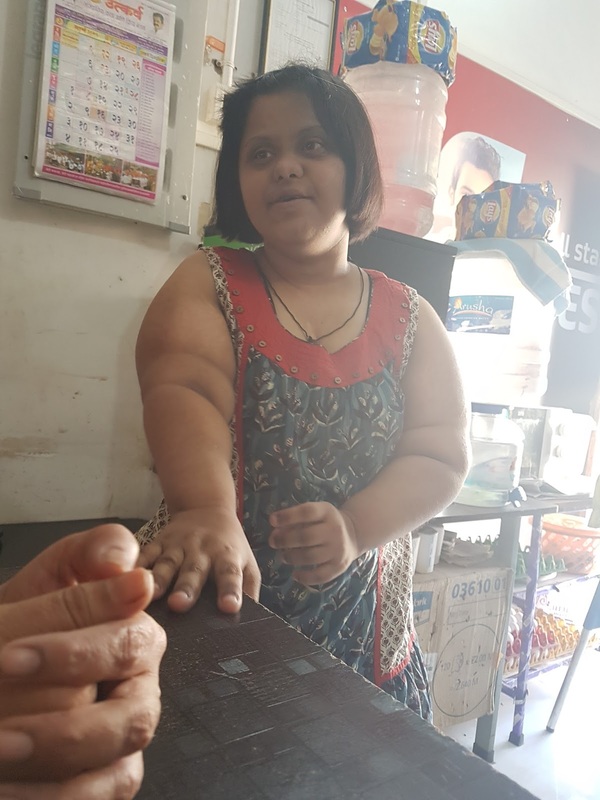 She has two staff members, Sardar Paramjit who takes care of cooking at the café and Ram, the delivery boy, who carries the deliveries to the offices in the mall. Phone rings and she takes pen and jots down the order. Some one in the mall wants sandwiches and coffee. She repeats the order to her delivery boy and then turns her attention back to us and talks about herself. At 6pm she will go home. Later, we go one floor down the mall to meet her father who owns an office in the same building. He is one proud father who speak fondly of her achievements. Hope is re-kindled for other special children too. Brain damage leads to improper control over muscles & body movements. Person with Cerebral Palsy can undergo College Education & take up employment. Persons with HI can talk if trained early in life. They can be educated & trained to lead a normal life. They do not need your sympathy. They need your support. Physical disability is not due to sins in previous life.They can lead a normal life with proper rehabilitation.They do not need your sympathy. They need your support. Mentally Retarded are not Mad.Person with Mental Retardation can be educated & trained to lead a normal life. They do not need your sympathy. They need your support. Come, Join us in this movement. MD's need to be identified early in life.Take them to a therapist early.They do not need your sympathy. They need your support.